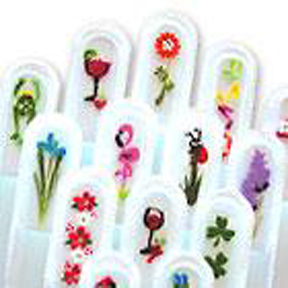 Our hand painted crystal glass nail files will never wear out and are perfect gifts for everyone on your list. When you use a crystal glass nail file you can feel the difference immediately. You will see it’s a very fine filing surface which makes the nail smooth and reduces peeling and splitting of the natural nail. It’s better than any other nail file in the market and they are guaranteed to never wear out or wear down because the grit is permanently etched into the surface of the glass file. The small file is perfect to carry in your purse, the medium file to keep at home and the large file is great for your feet after you shower.